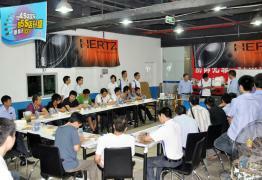 Elettromedia provides car audio lessons in Shenzhen, China. A delegation from the Masters Training Institute, the educational facility created by Elettromedia to train specialty centres, flew to the South-East area of Asia to offer its know-how to 30 industry professionals. Following the MTI format, the “Fiberglass Advanced Techniques” training combined the theory and practical elements related to working with resin based material. The purpose was to convey to the attendees the concept and the need of merging cosmetic integration, excellent sound quality and, most of all, to expedite the actual build time required to meet the market’s demanding requests. And, especially, to increase profits! The training was conducted by Mauro Gagliardini, one of Italy’s most renowned experts in the application of fiberglass pertaining to car audio installations. For many years, Mauro has collaborated with Elettromedia in research and experimental projects. A Bit One workshop was held before the fiberglass training: an in-car hands-on session on system design and adjustments with a spectrum analyzer, enthusing the attendees. For the duration of the workshop everyone showed keen interest, which turned into real frenzy in front of the router table and the finished fiberglass project. The session ended with the presentation of the AZ Audiocomp products, which was met with great success. The training was arranged by Mr. Wu Jie, owner of the company “Special City”, our Partner for China. Through a highly specialized team, Special City manages many training programs for their affiliates. Special City is a franchised network of around 200 stores, dedicated to the car aftermarket industry. They have a strong devotion to car audio, and are present in all of the major markets within China. The Special City store located in Shenzhen occupies an area of 4.500 square metres and the entire area is dedicated to car audio: it is likely one of the biggest car audio specialty stores in the world. The recent training held in Shenzhen is part of a continuing education cooperative project between Elettromedia and Special City; an ambitious challenge supported by a +20 year know-how as well as huge investments in research and innovation. Check out the Photo Gallery Elettromedia for pictures of “Fiberglass Advanced Techniques” training.